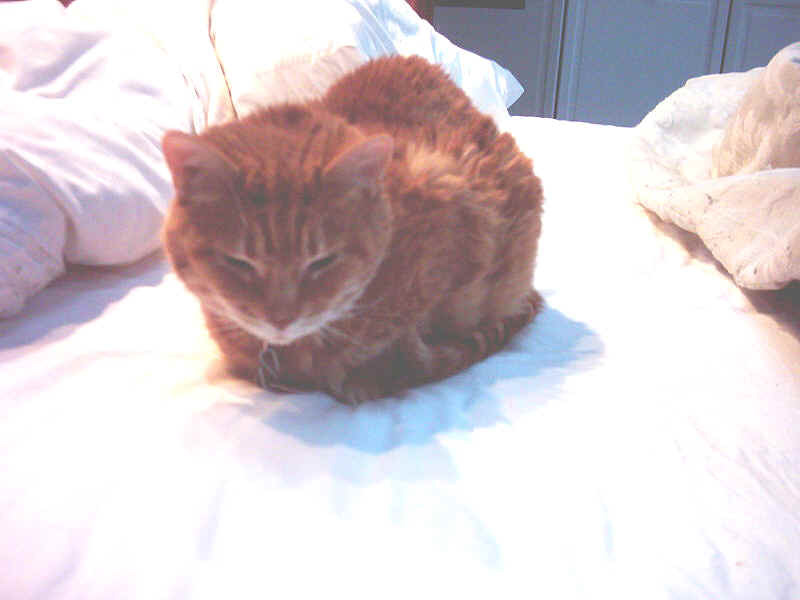 She was the most incredible, loving and wonderful cat I ever knew and that could ever exist. She was 12 years old. I am not sure when she was born, but it probably was in January 2002, for I got her when she was just a little kitten. I held her and she purred and I knew she was special. She was so smart. She would come when I called her, always slept under my left arm and whenever I came home from a walk with my dog, she knew she was going to get a treat like the dog and so would meet me in the kitchen. I used to keep catfood in a corner cupboard on the floor and she always knew how to open it. Amazing. She followed me wherever I went, her and my dog. And when she wanted to eat or a treat she would meow until she got what she wanted. But it never once bothered me. When I watched t.v., she would always jump on my lap for love and for a good brushing. I loved her. Brandy was never really healthy. When I got her I had to bring her back to the Anti-Cruelty Society (Chicago) to put a tube in her throat because she could not eat. 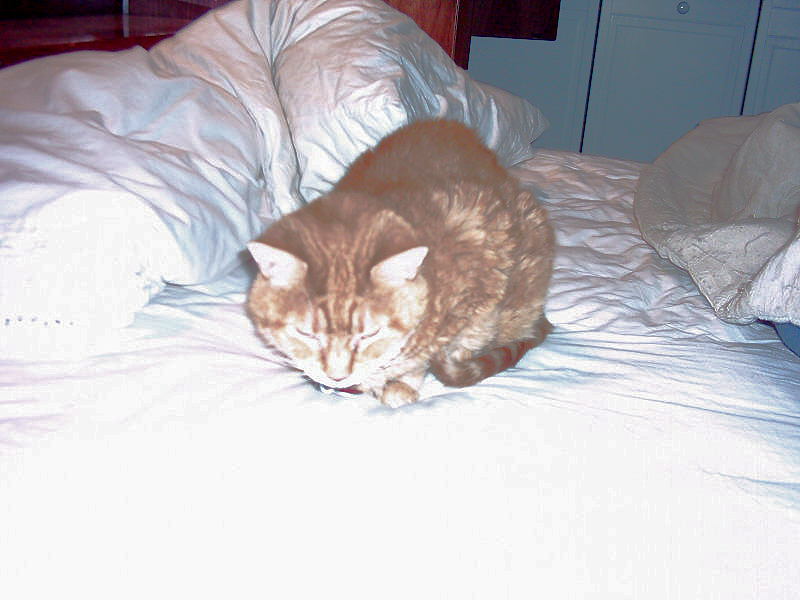 She later became hyperthyroid and I had to give her a pill each morning and each night. This lasted for a couple of years I think. 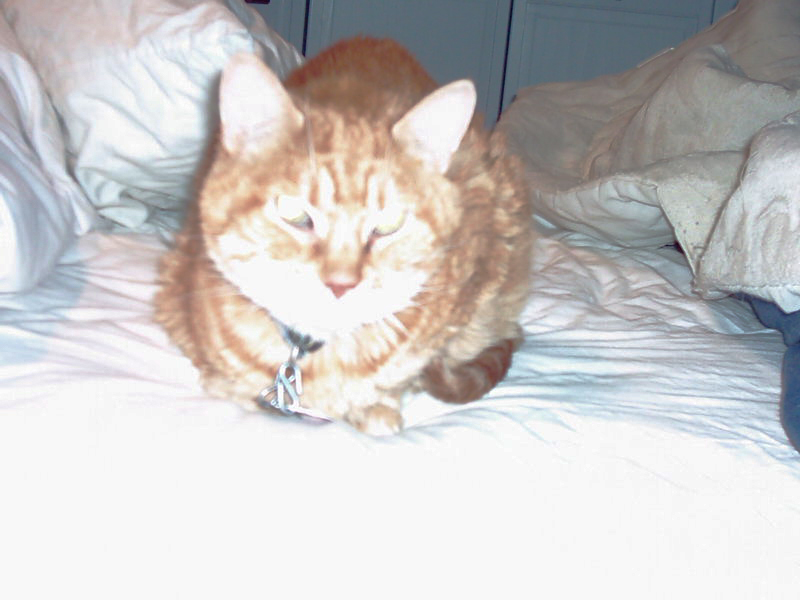 On November 9, 2004, I took her to the vet because she was wheezing when she breathed. The vet said it was probably allergies and gave me some clavamox. I also gave her some antihistamine tablets. 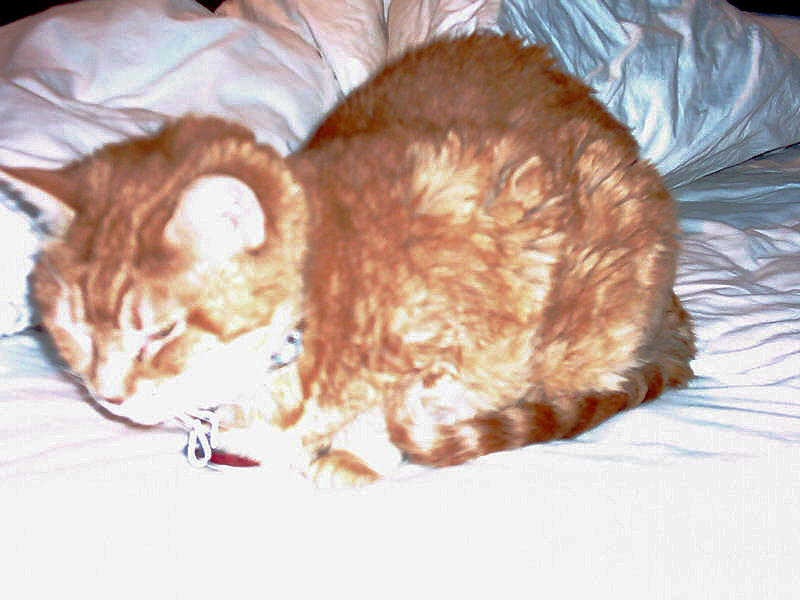 A week later, November 16, 2004, she had not changed so I brought her back. The vet called for me to see the x-rays she had just taken. There was a very large obstruction in her windpipe and the vet told me to go see a specialist right away. Though around 5:00 p.m. I did. He told me it had to be removed and that he could not do it, I needed someone with great facilities and there were only one or two vets that he knew who could do what was needed. He told me the operation was needed in a day or two, no longer could there be a wait. In the meantime, my brother Les, the greatest guy in the whole world, had lined me up with an appointment with a fabulous and worldwide known surgeon. He had Thursday morning, November 18, 2004 set aside for me even before I knew what was happening.. I brought Brandy there the night before because I was afraid she wasn't breathing but the vet told me it was okay and to come back tomorrow. Thursday morning came. The operation lasted one hour and half or so. They had to remove the trachea and the larynx. Brandy would never speak again and had to breathe through a hole in her chest. But the real concern was if her nerves and muscles that controlled swallowing had been damaged. The tumor had been enormous. If she could not swallow she would not make it. By Saturday she was swallowing normally and seemed that she would go home with me by Sunday or Monday. I was going to the hospital everyday and then taking her to the emergency hospital at night. On Monday we heard the bad news. Her cancer was lympho carcinoma, a terrible cancer to begin with but she had an extremely virulent strain. It multiplied under a microscope at the 12 division parameter, while normal cancers were in the 2-3 range. There was still hope though; I would never give up. I could go on and maybe someday I will. But the day after Thanksgiving, November 26, 2004, Brandy died. She had had another operation around 5:00 p.m. that day as a last ditch effort to remove terrible infection and to put another feeding tube into her stomach (the first one had slipped and the food had not gotten into her stomach, thus she had not eaten for several days and the food and water was uselessly putrefying inside her). But with her kidneys and liver giving out, chewing having stopped, albumin levels very low and unable to be increased, phosphorous levels increasing, white blood cells multiplying to fight the lymphoma and the red blood cell count falling, it was an effort that did not work--even with the non-stop praying that we all did . But right after the operation, she could turn her head, her eyes were green again and she seemed to be moving around. Then when we breathed into her breathing tube and she came back I thought we would be okay. Same thing when her heart stopped a few times and we got it to come back. But by now her gums were all white and her eyes as well. There was no visible blood vessels to be seen in them. Then we were told that she was braindead. I held my breath and heard myself give the euthanasia order. The people at the hospital all agreed she was the sweetest cat they had ever seen. 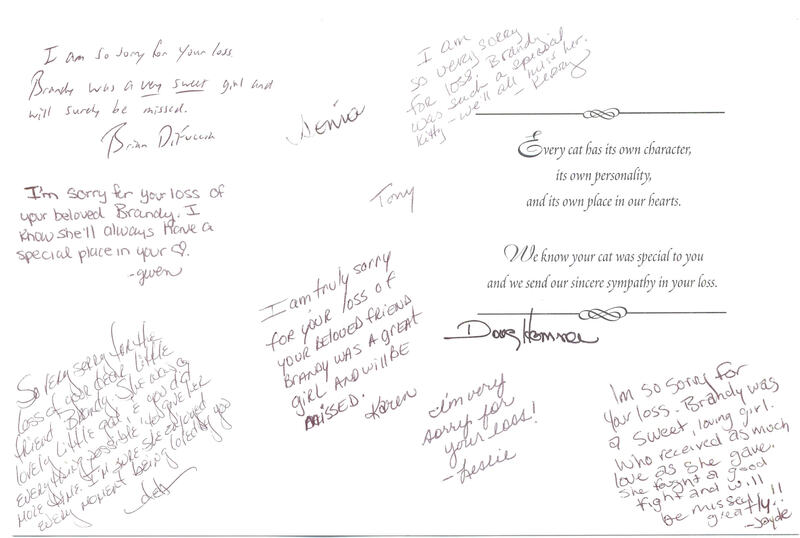 They and my vet sent me cards that you can see below. She never once complained about what was happening to her. Maybe she knew. But she also knew how much she was loved. Brandy had suffered no pain. That I would never have let happen. Brandy had been a real trooper through the whole thing. Brandy always welcomed me when I came to the hospital as she always did: opening her mouth and meowing. Only the last few times there was no sound. But she always knew when I was there. I would lay on the floor of a private room with her. The vet gave me two blankets, one to lie on and one to cover us with. Brandy would cuddle like always and lay on my coat, just to smell the familiar. I prayed for her very much and Les was with me at the hospital many times and he was at the hospital at the end. The pictures above and below are those that I took on November 17, 2004 (I think) before taking her for her first operation. I tried to retouch up some of them. I am so upset that I didn't take better ones. She was so loving and wonderful words cannot express my grief and loss. I kept her collar and her two last tags. This time of year is not good for me. Five years ago on November 19 my mom died. My birthday is on December 4 but there has not been a celebration in years. Two of my cousins died this past December 19 (one was murdered) and my last remaining aunt died this past December 13. My remaining cat (there had been three) and my dog keep me comforted these days. Barely two weeks after I first took Brandy in for what seemed a routine allergy she was gone. I can't believe it. My last cat is very lonely now. So am I. 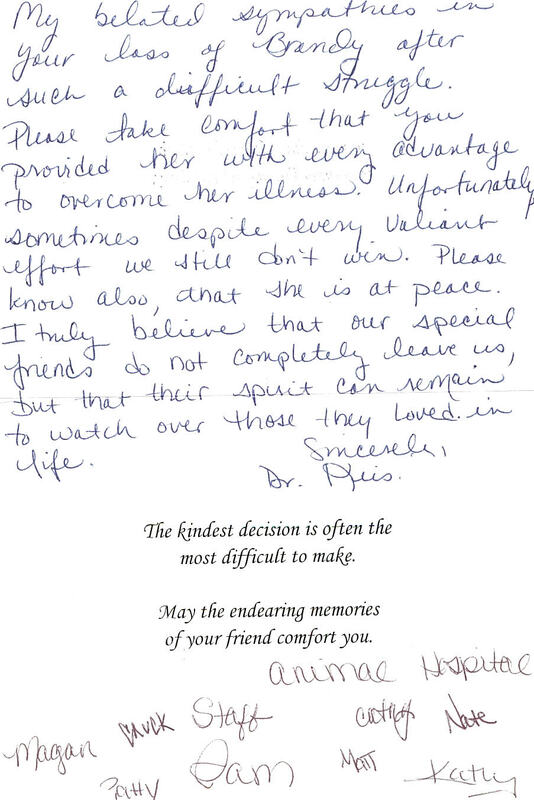 This card was received from my great regular vet.